EDMONTON — It turns out the third time was the charm for the Calgary Stampeders. 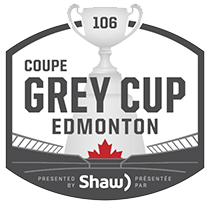 After two consecutive years of Grey Cup heartbreak, the Stamps got it right on Sunday night in Edmonton, earning a wire-to-wire 27-16 victory over the Ottawa REDBLACKS to capture the 106th Grey Cup presented by Shaw. Bo Levi Mitchell threw two first-half touchdown passes, while Terry Williams scored on a Grey Cup record 97-yard punt return as the Stamps erased their ghosts of November’s past in front of 55,819 fans at The Brick Field at Commonwealth Stadium. Brampton, Ont. native Alessia Cara performed at halftime, but in the end it was Williams’ record-breaking romp with one second left in the first half that stole the show, giving Calgary a 21-11 lead at the half that would not be relinquished. Don Jackson and Lemar Durant also scored for Calgary, while Julian Feoli-Gudino struck for the REDBLACKS. Rene Paredes and Lewis Ward each booted a pair of field goals. Mitchell finished with 253 yards on 24-of-36 passing but also threw two interceptions. REDBLACKS starter Trevor Harris countered with 288 yards and a touchdown, but also threw three picks on 20-of-38 passing. Stamps receiver Eric Rogers had a team-high 64 yards on six catches, including three on second down. RJ Harris had a game-high 66 yards on four catches to lead the REDBLACKS. The Stamps threatened to score on their opening possession of the game, but a promising drive ended abruptly when Mitchell’s pass intended for Bakari Grant was underthrown and intercepted by Jonathan Rose. The turnover marked Mitchell’s sixth interception in four Grey Cup starts. Mitchell would get a chance for atonement soon after. With the REDBLACKS hemmed up in their own end, Harris’ pass over the middle was intercepted by defensive back Ciante Evans. Juwan Brescacin‘s third catch of the opening quarter then set up the perfect screen pass, with Mitchell dumping it off to Jackson for an easy 23-yard touchdown, putting Calgary up 7-0 with just under five minutes remaining in the opening quarter. The REDBLACKS moved the ball on their ensuing possession but Ward, nearly perfect throughout the regular season, missed his third field goal of the post-season on a try from 48 yards out. As the first quarter came to an end, the Stamps’ seven-point lead had much to do with the field position battle, with Calgary’s starting field position starting at the 48-yard-line compared to the REDBLACKS starting at their own 24. Lewis would redeem himself on his second attempt early in the second frame, hitting from 30 yards out to get Ottawa on the board. Ahead 7-3, though, the Stampeders responded in orderly fashion. On second-and 10, Rogers fought off tight coverage from Kyries Hebert to make a highlight-reel 20-yard grab. Mitchell struck again on second down, finding a wide open Canadian Julan Lynch for 26 yards down to the Ottawa 34. After another second-down conversion by Rogers, Mitchell made one of his best plays of the half when he bought time with his legs, escaping pressure to his left before throwing across his body to Durant for a 17-yard touchdown. Mitchell’s work on second down made the drive possible, as he completed all three second-down passing attempts for 57 yards. The eight-play, 80-yard scoring chewed 4:22 off the clock and put Calgary ahead 14-3. Just when they needed it most, lightning struck for the REDBLACKS. Harris found an open Feoli-Gudino, who broke a tackle on his way to a 55-yard touchdown. J.C. Beaulieu caught the two-point convert from Harris, cutting the deficit to 14-11 for Ottawa. It looked like that would make it a one-possession game at the half, but one speedy returner did just what he was brought in to do. Williams caught Richie Leone‘s punt at his own 13, weaved through a crowd of defenders and then sprinted past the kicker, scoring a Grey Cup record 97-yard punt return touchdown. The score left just one second left on the clock, putting Calgary up 21-11 after the game-altering play. Calgary had led after halftime in seven Grey Cups going into the game, going 5-2 over that span with the losses coming in 1968 and last year, 2017, vs. Toronto. The REDBLACKS chipped away at the deficit early in the third, as RJ Harris‘ grab down the sideline set up a 41-yard field goal by Ward, his second of the night. Calgary replied quickly though with Rene Paredes‘ first of the night, a 34-yarder that would restore the Stampeders’ lead to 10. Paredes’ field goal put him in the lead for Grey Cup field goal percentage with a 10-for-10 mark, passing former Argos kicker Mike Vanderjagt (9-for-9) based off attempts. Down two scores and in need of a spark, things turned worse for the REDBLACKS early in the fourth quarter when Diontae Spencer fumbled on a punt return. It was recovered by Stamps special teams ace Wynton McManis, giving Calgary the ball back in optimal field position with 13:33 left. The REDBLACKS’ defence would hold as Matthews couldn’t catch up to Mitchell’s second down pass in the corner of the end zone. However, Paredes’ second field goal of the game extended Calgary’s lead to 27-14. The REDBLACKS appeared to cut the deficit to a single score when Harris’ toss to the end zone was apparently caught by a sprawling Greg Ellingson. However, upon further review, the ball was trapped, forcing the Ottawa offence back on the field for a second-and-10. After a pickup of nine by Brad Sinopoli, Harris went back to Sinopoli on third-and-one, only for Jamar Wall to knock the ball loose, forcing a turnover on downs. With the three-minute warning already passed and the urgency level high, Harris took a deep heave into double coverage looking for RJ Harris, only for Wall to come up with the interception, all but sealing the REDBLACKS’ comeback hopes. Junior Turner closed the game out with the Stampeders’ only sack of the night. Still, it was a big night for the Stamps’ defence, including three interceptions off Harris by Wall, Evans and rookie Tre Roberson. Alex Singleton had eight tackles, tying a game-high with Ottawa linebacker Kyries Hebert. JR Tavai had six tackles and a sack to lead the REDBLACKS, who finished with more net yards than Calgary with a 379 to 339 edge, but also turned the ball over six times compared to the Stampeders’ two. The Stamps won despite throwing two interceptions, becoming the first team to win when throwing multiple picks since 1994 when Danny McManus and and Kent Austin played quarterback for the BC Lions.